Luxury Yacht Andiamo is now available for charter. ANDIAMO is in a league of her own! With a versatile layout she can accommodate 8 Guests in 4 Staterooms. 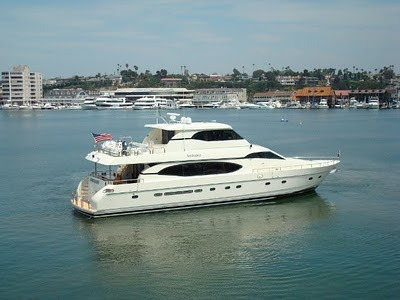 She is perfect for couples with her four double staterooms. Families with children may prefer to utilize the twin cabin which features upper and lower beds. No matter the scenario guests will be sure to experience first class service and loads of fun! The extra living space of the Skylounge is an unexpected luxury onboard an 82' yacht. Everyone can spread out, relax and watch a movie on the 57" 3D TV. A totally reconfigured flybridge features custom built U-shaped settees and a hydraulic teak table for cocktails or dining. ANDIAMO offers an abundance of tenders and toys and Captain Kevin Bell is a fishing, diving, and fun aficionado!